Project Form The Project UI provides a 'project' centric view of the Outlook information. Started from the Task Pane, it displays the project's dashboard, Tasks, Calendar, and Contacts. It adds Notes and Documents tabs if those pointers are specified in the project's properties. Project Tasks The project tasks tab shows the project's tasks and each task's sub-tasks. Unlimited levels are supported. Any task's conversations are also tracked using a special reference number - so a discussion regarding a specific task can be tracked. Project Gantt A project Gantt view is provided so tasks can be managed in time and by milestone. 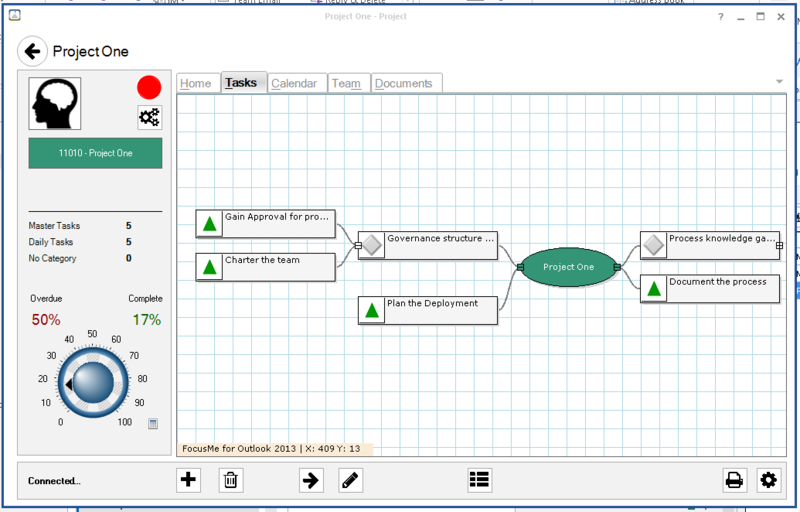 Create a task hierarchy for a project using the mind mapping tool built into the project manager window. My favorite view, leaving this view up while working reduces e-mail distractions. And focuses on task lists, e.g. tasks today in the To-Do bar and filtered lists in the Organizer Pane. Link OneNote with Outlook to never miss an action item from your notebook. To reduce the footprint from the calendar view - FocusMe now enables the Task Pane to be undocked. When Outlook is minimized, the task pane stays active off to the side of your screen. When using a smaller screen, e.g. a laptop or tablet - the Dashboard and/or Charts window can be collapsed. Depending on the type of subscription, you can Share via Email or Share via a service (e.g. FocusSync or SharePoint). Sharing via Email creates a forwarded message that uses a tracking task and unique reference # to identify the subsequent conversation. New e-mails can be processed using the 5Ds, delete it, defer it to a task or appointment, delegate it, or file it in the drawer (Outlook folder, Journal entry, or Windows folder). Conversations can also be filed in the drawer. Tasks can be assigned to a project and/or to a Focus (context). When ready to begin a task, a timer can be started to track the time spent. Or the Scheduler can be started to show free/busy times during the week to best schedule the task. Start a conversation around a task and track the subsequent email messages. Achieving your Personal Mission starts by reflection, requires imagination and takes life with declaration. Declaring roles helps you focus on becoming the person you imagined. Use the Travel button to measure the distance you're traveling (in miles or kilometers). If you need directions, they can be inserted directly into the appointment body. Use the milestone buttons to reuse previous addresses. If you bill by the hour, you can set the hourly rate for a project, and track the billing using the Calendar. View the billing summary chart via the Task Pane and export to Excel via the Timecard to interface with your billing software. Right click on any incoming email or contact and show the contact's requested tasks, conversations they contributed to, and projects they are linked or assigned to. Right click on any email address in any form to display conversations that include that emailer. If the person is a contact, then open tasks will be presented and any project they are linked or subscribed to.